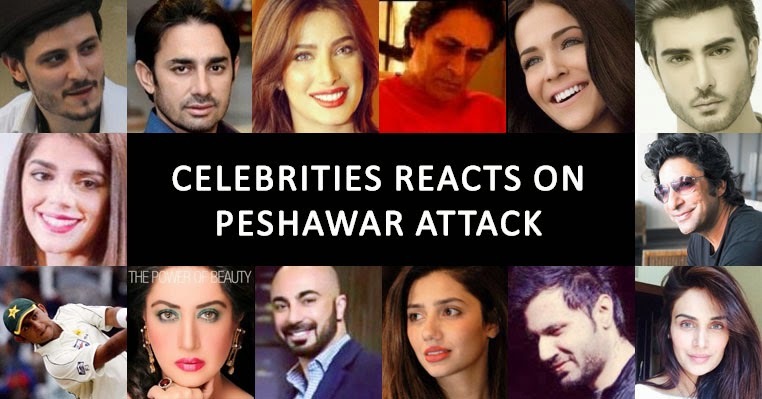 Pakistani celebrities from entertainment to sports reacts on Peshawar Attack. Indeed the incident was one of the biggest in the history of Pakistan. Every one in shock and still did not accept that 141 innocent lives has been murdered in Army Public School. Here are some of the celebrities tweet who condemned the Peshawar Attack happened on 16th December 2014. Peshawar incident... why innocent kids has been targeted ??? This is not a time for political name-calling. Please, let us stand united today. MT @NJLahori No politics, only prayers. Devastated because of the most heinous and heart wrenching incidents of the recent times happened in Peshawar today. Images of dead bodies slumped in bloody classrooms & parents screaming over coffins can't be comforting 2 families of deceased.Be sensitive! Shameful how our innocent children are being barbarically murdered by cowards ! Imagine the pain of pathan parents who for generations have been blamed for not sending their kids to schools. Now burying them in uniforms. Janazay kay saath phool daikhay, Kal Pehli baar phoolon ka janaza daikha. No court, no hearing! Find a terrorist, kill a terrorist and their aides. No tolerance because its about that time. Watching horrific footage of my beloved homeland under attack. My thoughts and prayers are with the people of Peshawar . Absolutely devastating news about the #PakSchoolAttack . Prayers, thoughts with the families & teachers. Very very sad day. My prayers are with the innocent school children who have lost there souls today in Peshawar. Bomb blast in Peshawar...This is soo brutal with kids and their parents... Sad ?? ????? ??? ???? ???? ??? ?? ??? ?? ???? ???? ?? ??? ??????????? ?? ?????? ???! ???? ?? ?? ???? ??? ????? ????? ?? ?? ?? ??????? ?? ??? ?? My thoughts n prayers r wid the parents n families of the children gt effected by the attack in Peshawar..
Definitely there are hundreds of other from the celebrities but not possible to put together in one post.